Seed suppliers here; Purple Carrot Cake recipes here; Nutritional Properties here. 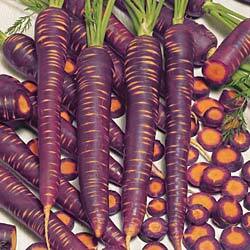 Purple carrots range in colour from dark violet to reddish purple, with an orange or yellow core. They can often have a peppery flavour. Cultivars include Cosmic Purple, Purple Haze, and Purple Dragon. Some varieities contain 20% less sugar than traditional orange carrots and are therefore ideal for those who need to follow a diet low in sugar. Cultivated carrots originated in the Afghanistan region and were yellow and purple. From this center of domestication carrots were grown as a root crop to the East and West of this region with the incorporation of several characteristics contrasting those two geographic regions. The Eastern carrot spread to central and north Asia and then to Japan. Red coloured carrot is typical for India and also was introduced to Japan. In contrast, Western carrot type is characterized initially by yellow and later by orange root colour. This carrot type spread to the West and now dominates in Europe and America. Carrot is rich in pro-healthy antioxidants both of lipophylic (carotenoids) and hydrophilic (phenolic compounds) characters. 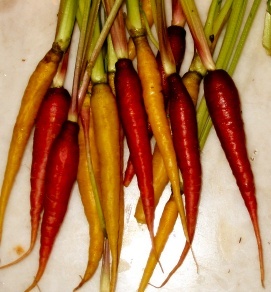 Although carotenoid content varies considerably among carrot genotypes, usually orange carrots contain high amounts of α- and β- carotene; yellow carrots contain lutein, the red colour of carrots is due to lycopene, while polyphenol substances, mostly anthocyanins are typical for purple roots. 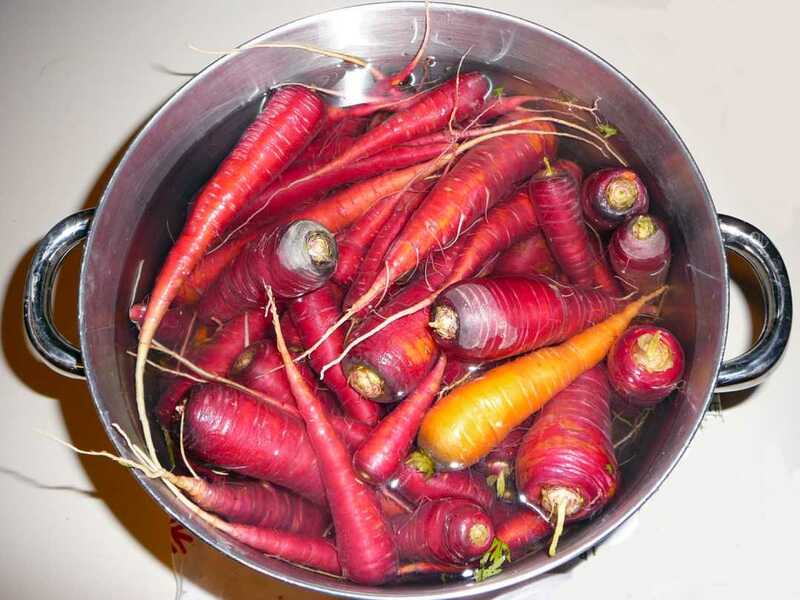 Carrots of Asian origin belonging to Eastern gene pool are more often purple or red and richer in phenolics and have higher antiradical activity than those from the Western gene pool which now have mainly orange roots. 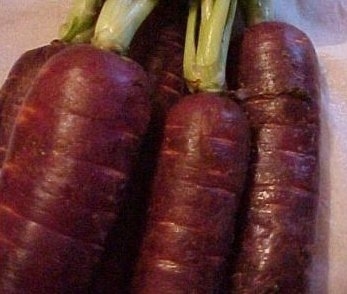 One study found that, compared to orange carrots, purple carrots contain twice the amount of alpha and beta carotene, which the body converts into vitamin A, this is in conflict with most other, more recent studies which show purple varieties tend to to have the same or less beta carotene, than orange varieties. 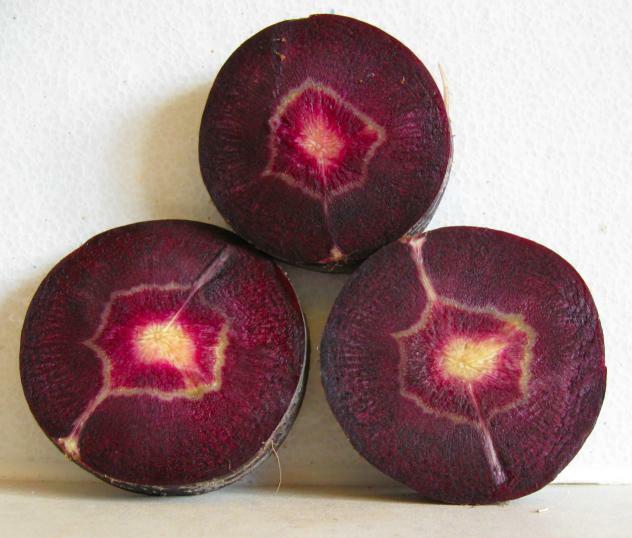 It is difficult to be definitive when thare some many different variants in the core colour of purple carrots. Read this informative article in the Wisconsin Magazine for Life Sciences on how to make a purple carrot here. 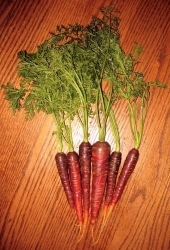 Purple carrots (usually orange or white inside) have a high beta carotene content like their orange cousins, and get their pigment from anthocyanins, these pigments act as powerful antioxidants that protect key cell components, grabbing and holding on to harmful free radicals in the body. Anthocyanins also help prevent heart disease by slowing blood clotting and are good anti inflammatory agents. These originate from Turkey, and the Middle and Far East. 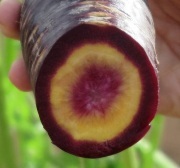 See also the famous, unique, purple/black carrots of Cuevas Bajas, Spain, here. The cultivated carrot is believed to originate from Afghanistan before the 900s, as this area is described as the primary centre of greatest carrot diversity (Mackevic 1929), Turkey being proposed as a secondary centre of origin (Banga 1963). 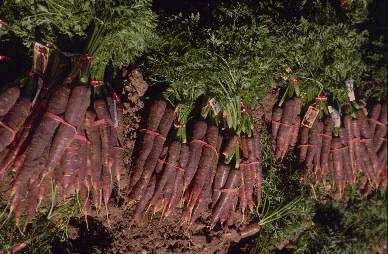 The first cultivated carrots exhibited purple or yellow roots. Carrot cultivation spread to Spain in the 1100s via the Middle East and North Africa. In Europe, genetic improvement led to a wide variety of cultivars. White and orange-coloured carrots were first described in Western Europe in the early 1600s (Banga 1963). Concomitantly, the Asiatic carrot was developed from the Afghan type and a red type appeared in China and India around the 1700s (Laufer 1919; Shinohara 1984). According to this history, it makes sense to envisage that colour should be considered as a structural factor in carrot germplasm. Purple (or almost black) carrots grow mostly in southern Europe and Asia. Their characteristic purple or black colour comes from pigments called anthocyanins. These pigments exhibit a reversible change in molecular structure as the pH of solutions change from acidic to basic. This change in structure is characterized by a shift in hue from red to purple to blue as the pH changes from acidic to basic. Many of the pigments in carrots serve to shield plant cells during photosynthesis. Purple carrots possess an entirely different class of pigments from the other carrot colours - anthocyanins - which act as powerful antioxidants. Red carrots derive their colour mainly from lycopene, a type of carotene believed to guard against heart disease and some cancers. Yellow carrots accumulate xanthophylls, pigments similar to beta-carotene that support good eye health. Wild carrot has a small, tough pale fleshed bitter white root; modern domestic carrot has a swollen, juice sweet root, usually orange. By the 10th century purple carrots were grown in Afghanistan and northern Iran which are considered the centres of origin. 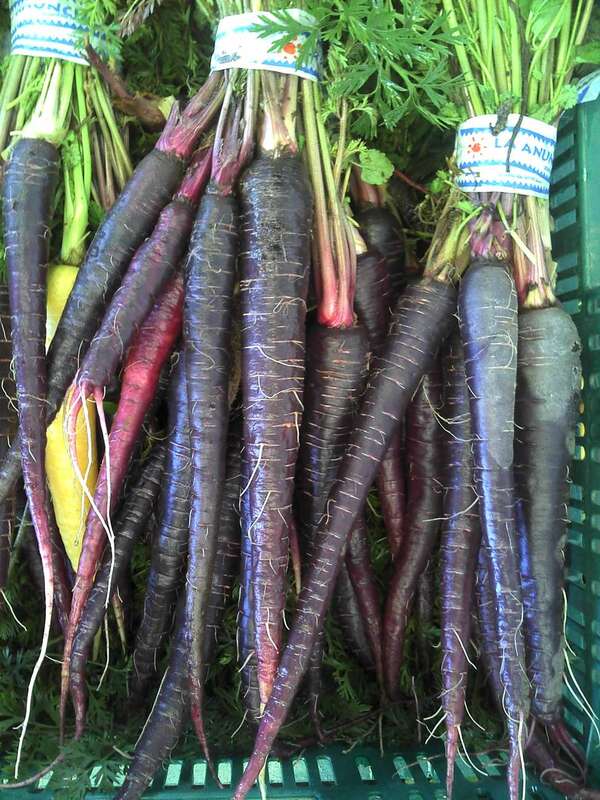 Purple, white and yellow carrots were imported to southern Europe in the 14th century. Black, red and white carrots were also grown. Purple carrots were used as a clothing dye for Afghan royalty. Much later, in the 16th century some motivated Dutch growers developed orange rooted carrots and made them sweeter and more practical. According to plant scientist Dr Hazel MacTavish-West, research suggests eating a purple carrot a day has the potential t o protect against cardiovascular disease, inhibit cancer cells and reverse negative effects of a high-fat diet, among other benefits. It comes after a number of research projects indicated this, including last year's University of Southern Queensland study into the ancient carrot variety that found purple carrots were high in anti-inflammatory properties and antioxidants. Results of the pre-clinical trial on rats when fed a high-fat diet got fat, developed high blood pressure, became glucose intolerant and had liver and heart damage but after being fed purple carrot juice for several weeks everything was back to normal. 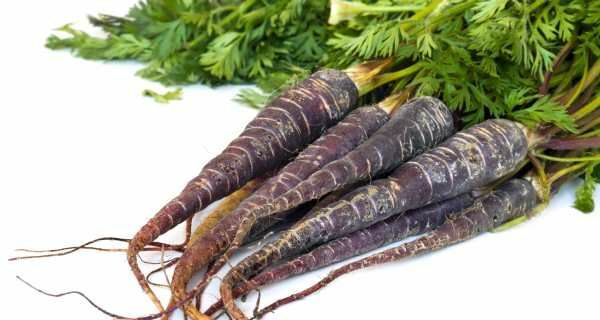 Purple carrots contained up to five times more phenolics and falcarinol than orange carrots and both compounds are being investigated for their potential to protect against cardiovascular disease, inhibit the development of cancer cells in the body and reverse the negative effects of high-fat diets. Purple carrots are best eaten raw to get the maximum benefit but can still be steamed, boiled, roasted and juiced. A study reported in the British Journal of Nutrition stated - The present stud y demonstrates for the first time that treatment of the metabolic syndrome induced by diet in rats with purple carrot juice attenuates or reverses the changes in cardiovascular and liver structure and functions as well as in metabolic parameters, especially abdominal fat deposition and plasma lipid profiles. As the juice itself contained low concentrations of carotenoids, it is likely that the anthocyanins are responsible for the antioxidant and anti-inflammatory properties of purple carrot juice. Furthermore, b-carotene alone produces limited and sometimes contradictory responses compared with purple carrot juice in this rat model of the metabolic syndrome. 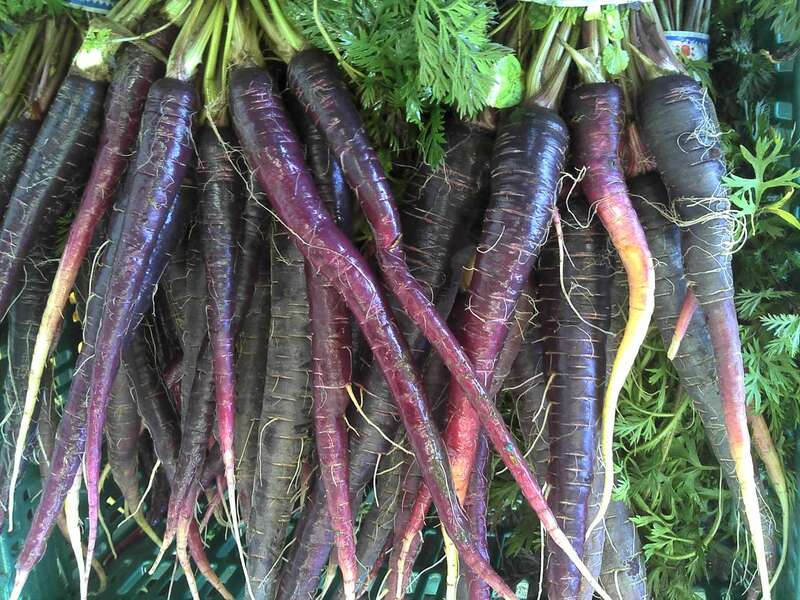 Purple carrots are even higher in antioxidants than orange carrots, and they also possess anti-inflammatory properties. This could make them very useful in the treatment of arthritis. They have been found to be antiviral, antiseptic and antimicrobial, and they also contain anticarcinogens and betacarotenes. They also contain phytochemicals including carotenoids, polyacetylenes, isocoumarins, phenolics and sesquiterpenes. Phytochemicals have antioxidant, anti-bacterial, and other disease preventative and health enhancing properties. Anticarcinogens help to reduce the risk of cancer and also help to fight against any already-present cancer cells in our bodies. Purple carrots are also excellent at fighting against viral as well as bacterial infections, such as flu, measles and internal infections of the urinary tract, mouth and stomach. Purple carrots contain high doses of Vitamin A, which helps to prevent clogging of the arteries and thus helps to prevent strokes. Along with that, they also contain vitamin B, C and E as well as calcium pectate, which is a very good source of fibre, and they help to lower cholesterol levels. They are also very useful in the prevention of macular degeneration. Studies into the health qualities of purple carrots have shown that they give us extra protection against various forms of cancer and heart disease. They contain purple pigments called anthocyanins, and act as anti-oxidants that protect the body. There are up to 28 times more anthocyanins - the antioxidant that creates the purple-red pigment in blueberries and raspberries - in purple carrots than there are in orange ones. • Agricultural Marketing Resource Center (AgMRC). Carrot Profile. 2011;Iowa State University, Ames, IO. Available online at: http://www.agmrc.org. • de Jesus Ornelas-Paz J , Yahia EM and Gardea-Bejar AA. Bioconversion Efficiency of B-Carotene from Mango Fruit and Carrots. Vitamin A Journal: American Journal of Agricultural and Biological Science Year: 2010 Vol: 5 Issue: 3 Pages/record No. : 301-308. 2010. • Imsic M, Winkler S, Tomkins B et al. Effect of storage and cooking on beta-carotene isomers in carrots ( Daucus carota L. cv. 'Stefano'). J Agric Food Chem. 2010 Apr 28;58(8):5109-13. 2010. • Kjellenberg L, Johansson E, Gustavsson KE et al. Effects of harvesting date and storage on the amounts of polyacetylenes in carrots, Daucus carota. J Agric Food Chem. 2010 Nov 24;58(22):11703-8. Epub 2010 Oct 21. 2010. • Lemmens L, Colle IJ, Van Buggenhout S et al. Quantifying the influence of thermal process parameters on in vitro B-carotene bioaccessibility: a case study on carrots. J Agric Food Chem. 2011 Apr 13;59(7):3162-7. Epub 2011 Mar 15. 2011. The 'carrot morá' of Cuevas Bajas - this peculiar vegetable in the municipality of Cuevas Baja, Malaga, Southern Spain. The village of Cuevas Bajas is blessed with a unique variety of carrot, the so-called "carrot morá", famous for its purple outer and unique centre. This peculiarity distinguishes this product from the rest of the know carrot festivals, which as we all know usually have an orange colour. What distinguishes this carrot is that when it is sliced the core it has an orange colour, as the traditional carrot, but it has a purple heart. It is said that the Arabs brought this variety from North Africa to Andalusia via the Silk Road in the 14th century. More information here. The Bartlett twins have grown the world's first bushy top purple carrots in a bid to make more Brits give the 'traditional' vegetable a go. Twin brothers Toby and Oliver Bartlett have developed the world’s first bushy top purple carrots at their family farm in Chatteris, Cambridgeshire. The purple carrots, which retain an orange centre, have now gone on sale in Tesco stores across the country to coincide with the forthcoming British Food Fortnight in early October. It has taken almost three years to develop the purple bushy top carrot variety; it is the first time the bushytop has been given this colour change. The 23-year-old farmers are the fourth generation of the Bartlett family to work on the farm, which also grows parsnips for Tesco. “We’re passionate about carrots and parsnips, and we want to get people as excited as us by introducing interesting variations,” says Oliver. The purple bushy top variety will be sold exclusively through Tesco for a year, but the twins have already received interest from trade customers. “We’ve recently introduced a shop on our website for the restaurant trade so that’ll be the next point,” says Toby. A few hundred years ago, all cultivated carrots were purple. The orange carrot was developed by Dutch growers in the late 16th century, using yellow strains. The brothers began working on the family farm five years ago and have introduced a number of innovations. Last year, the business also spent £1m building one of the UK’s largest solar panel installations, which will provide up to 25pc of its annual energy consumption. Turnover at the 1,456-acre carrot and parsnip farm currently stands at £40m. “The carrots will only generate a small amount of sales growth this year, but hopefully it’ll create more interest in the category,” says Toby, adding that colourful parsnips are likely to be next on their hit list. And ten years before, in 2002 - The carrot returned to go on sale in the summer of 2002 in England in its original colour - purple - the first time in five centuries. There was also talk of bringing back black and white varieties together with a rainbow version! Supermarket buyers were not too keen to try out purple carrots and sadly sales plummeted.. After pink tomatoes and green tomato ketchup they believed British consumers were keen to experiment. The experiment failed as British consumers preferred "proper" carrots! Carrots are the second most popular vegetable after the potato. This first commercial crop was grown near Ely, Cambridgeshire, and dark purple carrots with orange insides were sold at Sainsbury's stores in July. They attempted to brighten up the nation's dinner plates served as a violet purée, with its classic partner, the green pea, or in a salad. Mark Spurdens, technical manager for Isleham Fresh Produce, said : "Yes they are different and have had a little extra care and attention in the way they have been raised. We have had tastings and besides being healthy we think they are sweeter. They also look stunning sliced raw. We are already planning to sell rainbow bunches of carrots next year." Russell Crowe, root buyer at Sainsbury's said :" We are very excited to have dug up old ground and sell the purple carrot exclusively. Hopefully this unusual colour will influence children to eat more vegetables while parents can rest assured that there is nothing artificial about the carrots." Sadly the great British public did not take to them and sales were quickly withdrawn. A little odd when in the USA, Rainbow Packs of carrots sell well. Some links below give more detail of the seeds available to the home gardener. Popular varieties include Indigo, Maroon, Purple Dragon, Cosmic Purple & Purple Haze. Purple carrots are being explored as a source of such dyes is the purple carrot, ancient ancestor to the modern, orange version. Originally used as a clothing dye by Afghan royalty, the purple carrot is now regularly used as a reliable source of food colourings. Purple carrots are now propositioned as the next superfood. The fin dings of the recent Australian study revealed the ancient carrot to be packed with antioxidants and anti-inflammatory goodness - up tp 28 times more anthocyanins, which are antioxidants that are responsible for the purple-red pigment in raspberries and blueberries, than there are in orange carrots. 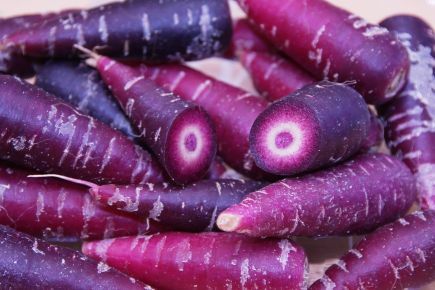 Lindsay Brown, professor of Biomedical Sciences at the University of Southern Queensland who is also the study author said the purple carrots are the original carrots from the ancient Persia. Purple carrots are one of the wide variety of fruit and vegetables that are almost lost in the era of single supermarket varieties, just like other ancient tomato varieties. While claims have previously been made about its health benefits, there were no tests to back up them, not until just recently. Conducting rat studies using purple carrots grown in Queensland, the rats were given high-fat, high-carbohydrate diet for 16 weeks to mirror the effects of unhealthy Western diet. The rats soon developed high blood pressure, became fatter and glucose-intolerant - or prediabetic - and suffered heart and liver damage. Subsequently, in the second eight weeks, purple carrot juice were added into the rats' diet. The results were a surprise to the scientists, and will be published in the British Journal of Nutrition. Prof Brown said miraculously everything went back to normal. "The blood pressure went down, the collagen in the heart was back to normal, the liver histology was back to normal, the liver enzymes, the glucose tolerance, the fat pads were all back to normal, despite continuing this ... terrible diet," she explained. Purple carrots should be eaten coupled with a moderate diet and exercise, advised Prof Brown. 1 and a half cups of shredded purple carrots; 2 and a half cups of plain flour; 1 and a quarter cups of sugar; 1 teaspoon of baking powder; 1 teaspoon of baking soda. For the icing: 4 tablespoons of butter, room temperature 8 ounces of mascarpone cheese 1 cup of powdered sugar. Toast the pine nuts in a toaster or a small pan for a minute or two until the aroma is enhanced. Preheat the oven to 350ºF. Use the tablespoon of butter to coat the inside of a 9X9 cake pan, then dust with flour. Take the shredded carrots and put in a microwave safe bowl. Add a tablespoon of water, cover and microwave for 1 minute to steam them and extract some of the colour. Let cool. Use an electric mixer with a whisk attachment to mix together the flour, baking powder, baking soda, cinnamon, ginger, nutmeg and a dash of salt. In another, and bigger, mixing bowl, use the electric mixer whisk to mix the sugar and eggs for 20 seconds. Next, while still running the electric mixer at a reasonably high speed, drizzle in the vegetable oil, very slowly at first. You are creating an emulsion so take your time to make sure the oil combines with the egg and sugar mixture before you speed up adding more oil. Once the oil is incorporated, add the flour, carrots, raisins and pine nuts to the bowl. Using a rubber spatula, stir everything by hand until combined. Pour the cake batter into the cake pan and bake for 40 minutes or until a toothpick in the centre comes out clean. Put the cake pan on a wire rack and cool for a couple of hours before starting on the icing. Make the icing by using an electric mixer to whip the butter, mascarpone and powdered sugar together until it lightens up and starts looking like icing, probably after about 1 minute. Put the icing on the cooled cake. Some people look at it and say that's one ugly carrot," says Leonard Pike,Ph.D. "But then other people think it's the most beautiful thing they've ever seen." Pike is referring to his latest creation: Maroon in colour, apple-like in texture and sugary in flavour, it's known as the Beta-Sweet carrot. For traditionalists who like their carrots to look and taste like, well carrots, the Beta Sweet can be a little off-putting. That's the way it goes with in the field of vegetable enhancement-a field that Pike pioneered back in 1992 as director and founder of the Vegetable Improvement Centre at Texas A&M University at College Station. Dr Pikes goal is to change attitudes, improve health and impact the world, one vegetable at a time. "To eat a wide range of vegetables is far more beneficial than eating hamburgers and French fries and relying on supplements" says Pike. He also points to the benefits his work can offer underdeveloped countries. "The people living in those countries are not going to take supplements, but they are going to grow and eat crops." BetaSweet' is a new “designer” carrot that was conceived as a research project with the objective to create a new high-quality vegetable with unique characteristics.The gene responsible for purple or maroon colour is a natural one that has been around for many years and, in fact, has been segregated out and discarded when it appeared in order to retain the traditional orange colour for carrots. In 1989, three carrots grown from Brazilian seed were observed to have a blotchy maroon colour mixed with the normal range, which gave Dr Pike an idea. Initially, he planned to develop a maroon carrot for home gardeners, similar to the long lost wild carrot from Afghanistan. He produced a maroon and deep orange Beta Sweet carrot, which matched the school's colours. Pike may have conceived this variety on a fanciful whim, but he soon learned that the purple pigment contained anthocyanins, which act as tough antioxidants, boosting the carrot's nutritional properties. The irony here is that Pike has actually put back what growers, in the name of aesthetics, took out years ago. 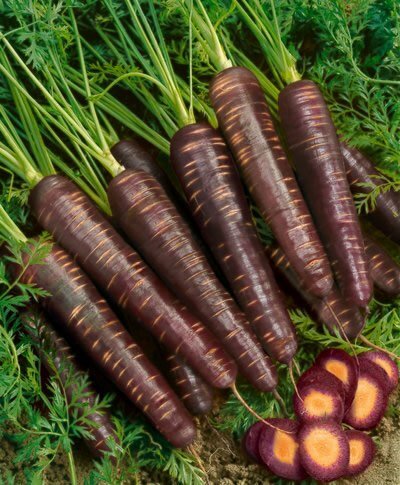 Naturally, carrots are either white or white with a purple rim, but the old breeders selected the orange carrot for its unconventional colouring! Read more about antioxidants here. 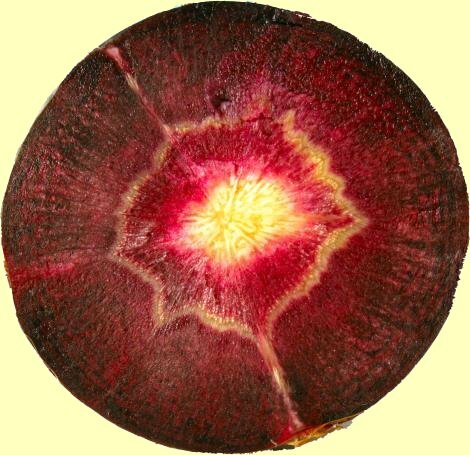 Within two generations of breeding effort, he obtained a few a carrot roots with near complete maroon exterior and orange interior. The contrast of orange and maroon was very attractive in carrots cut into coins or sticks. The research objective changed instantly from developing a novelty carrot into a 'designer' carrot variety with all the flavour, nutrition and health requirements possible. Dr Pike engineered the BetaSweet to have 50 percent more beta-carotene (a potent cancer-fighting antioxidant) than your garden-variety carrot. And its curious colour comes from anthocyanin, anot her antioxidant that preliminary studies show effectively fights disease-causing bacteria in humans. Early man used food to prevent disease. For a long time, the medical profession has treated disease with drugs and surgery. Now, we are seeing a return to prevention and an emphasis on disease-preventing vegetables. The purple carrot is a potent antioxidant, right along with blackberries, blueberries and cherries. Several additional generations of carrots were required in the development of BetaSweet using extensive laboratory testing for low terpenoids (strong carrot flavours), high sugars, high carotene, and crispy texture. Thousands of carrot roots were analysed and selected for desired qualities and for the dark maroon exterior and orange interiors. The few best for those characteristics were crossed and re-selected for their adaptation when grown under Texas climate conditions. Eventually, four advanced breeding lines were tested as potential commercial varieties. The name "BetaSweet" was selected from a "name the new maroon carrot contest" sponsored by Progressive Farmer magazine in 1995. The winning entry was sent in by John Dunckelman of Florida. Beta, for the high levels of beta carotene which are found in the carrot and Sweet because of its sweet taste. the variety was released in 1998.BetaSweet' taste similar to other carrots but has a very crispy texture which is easier to chew, much like an apple or piece of celery. It is also sweet and very attractive when cut into 'coins' or sticks. It only has a texture similar to an apple, but not the taste. BetaSweet carrots have been introduced to consumers in the US in the form of coins and sticks in a specialty-designed package bearing carrot cartoon characters to attract children. The family he started with is called the "Beta Bunch". We have "Beta Bites," a Beta Sweet teenage carrot girl and parents, "BetaKing" and "BetaQueen". They are also working on "MegaBeta," a little boy carrot with muscles," Pike reported. And how do they cook? Sliced and roasted for a salad, the colours darkened but remained true to their hue. Of course, all of this beauty comes with a steep price tag: The Beta Sweet variety is about twice the cost of bulk carrots. Maroon carrots can be used in any carrot recipe, but if left raw, either shredded into a coleslaw or dipped into a garlic mayonnaise, the colours, flavour and texture really shine. A new Deep Purple carrot variety grown for national retail markets by Coastal carrot barons the Ertler brothers, of the family- owned business Premium Fresh Tasmania, is aimed at health-conscious consumers already asking retailers for purple carrots, which have been tough to source. The Forth vegetable growing and packing success story started by the Ertlers 11 years ago is now one of Australia's major carrot producers, supplying 10% of the domestic market. The three Ertler brothers - Mike, Jim and Rick - say they are about four weeks away from when they will "revolutionise supermarket shelves" with their new Deep Purple carrot. It's the first time purple carrots will be readily available for retail sale across the country, the Ertlers say. In the heart of the North- West's prime agricultural region, the Ertlers trialled a few different varieties of purple carrots over a number of years before getting to this point. Mike Ertler describes their purple carrot as having "a very carroty flavour".